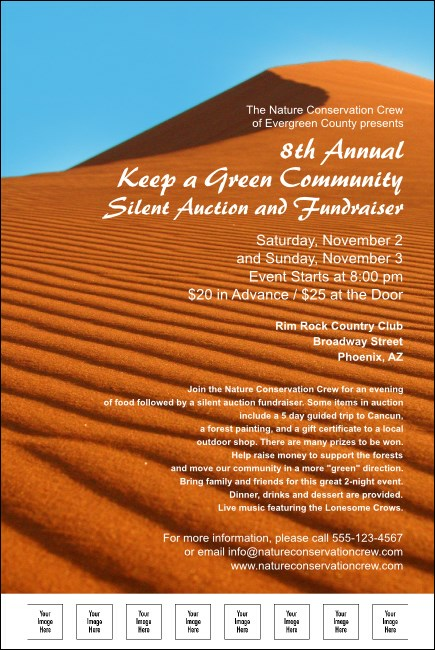 Turn up the heat on your fundraiser’s publicity with a stack of Nature Series - Desert Posters! Placed all over the community, this design makes a statement via a brilliant image of a sand dune and twenty-fine text lines about your event. Customize this template to your needs in minutes—we’ll print using 100% renewable energy and ship in a flash. Measurements are approximately 11.46" x 17.18"
Experience great quality, great customer service, and great prices on TicketPrinting.com!